An intriguing and innovative card game. Race against the clock to build a dazzling fireworks finale! Trouble is, you can see the cards that everyone holds...except your own. Working together, you must give and receive vital information in order to play your cards in the proper launch sequence. 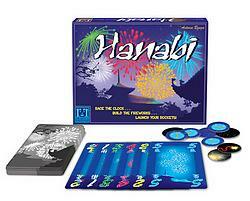 Build and light each firework correctly to win the game and avoid a fizzling fiasco! Game design by famed Seven Wonders designer, Antoine Bauza.